Hot Shoeing/Hot Setting or Hot Fitting A Horse/What Does That Mean? Hot Shoeing/ Hot Setting or Hot Fitting A Horse/What Does That Mean? Most of us have heard the terminology of hot shoeing, hot setting or hot fitting a horse for shoes. Just what does that mean, when is it done, why is it done, who does this, are there any down sides to it? There was a day when horse shoes had to be made from "scratch," that is the keg shoes and others we see pre-made today did not exist. The horse shoer, or farrier, had to fire up the forge and do everything from the beginning including making the nail holes! I remember when my farrier, Don Roof, had his forge in the back of his truck. He used to do everything himself, too. Today, Don has a forge, and still does use it on occasion, but uses the pre-made shoes and makes necessary changes to those shoes for whatever the task at hand may be. He has always told me that every horse is different, just like every other living thing. Don looks at the horse's way of going, how the horse stands, holds itself, rides under saddle, in a circle (both ways), looks at the horse's conformation--the shoulder angles, feet, pasterns, under part of the hoof, hocks, stifles, bone alignment, bone angles, length of toes, knees, foot direction, withers and croup, etc. He looks for any irregularities and then proceeds to shoe. After he does this appraisal he goes about preparing and placing the sho, depending upon what problems may exist. He is thorough and the best! There are many varying opinions about hot shoeing among those in the farrier field. 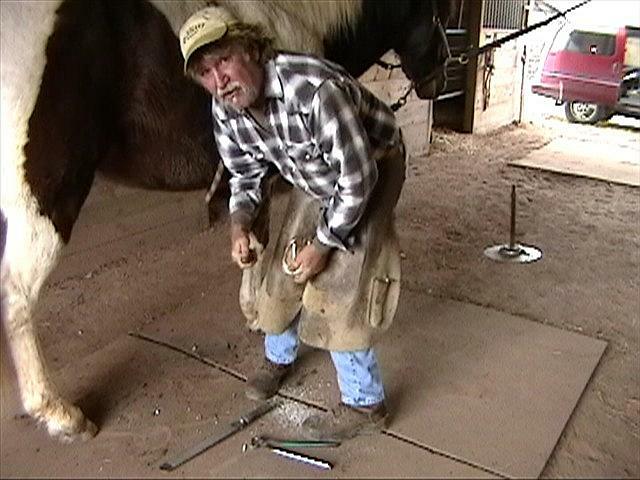 There are pros and cons, but Don has always told me that the most important thing to remember is that in order to do a good job when shoeing a horse--make sure the preparatory work to putting on the shoe is done well. The foot must be level and balanced--having a well and properly prepared surface. Hot shoeing will NOT resolve problems of an improperly prepared foot. Seals the cut horn tubules (epithelial cells) Good for wet weather conditions.